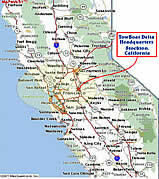 Our company Tow Boat Delta is a full service boat towing company servicing the entire California Delta. Click on the map to the left to view the Delta area. The Delta consists of over 1000 miles of waterways. If you aren’t sure if your area is covered by Tow Boat Delta, please contact us and we will be happy to assist you.